The Owensboro Convention Center was built with flexible meeting room options in mind. 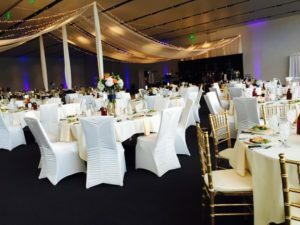 Whether you are planning a board meeting, consumer show, convention, or wedding, the center’s ample size and versatile space can be tailored to meet your needs perfectly. With an exhibit hall, ballrooms, meeting rooms, large lobby, pier, and panoramic views of the Ohio River, the Owensboro Convention Center can meet all of your event needs. Our first-class food and beverage capabilities allow us to offer custom menus, from continental breakfasts to 5-course galas. We are dedicated to exceptional service, delivered with a warm and innovative approach. Wondering how to get started booking an event? Check out the Just the FAQ’s – How to Book An Event video. While you are attending an event at the Owensboro Convention Center, take a moment and enjoy all the great things downtown Owensboro has to offer like Smothers Park located east of the convention center. You can also enjoy delicious food at the Artisan Café by Kentucky Legend® located in our lobby. To find out more about local activities and events, go to VisitOwensboro.com.